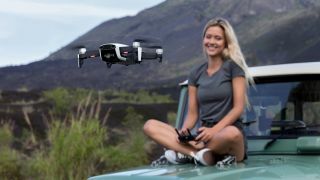 Our tech news this morning, courtesy of our friends at TechRadar, covers a whole host of bases – we've got updates on video streaming services, phones and tablets launching before the end of the year, an eagerly awaited AR headset, and two new DJI drones. Even the most loyal fans of Amazon Prime Video would have to admit that its interface isn't the most modern-looking out there – but Amazon is on the case, and according to Amazon Studio head Jen Salke, an early version of a visual revamp is already in testing. It should make it easier for you to get to the content you need, no matter what platform you're on. As the launch date for the 2018 Google Pixel phones draws closer (sometime in October or November, probably), the number of leaks and rumours are ramping up. Today we've got a sneak preview of the Google Pixel 3 XL in a 'Clearly White' colour, showing off a rather polished-looking handset with a distinctive display notch and a single-lens rear camera. Attention drone fans – we now know (or think we know) that the upcoming DJI Mavic 2 drone is going to come in two models, known as the Pro and the Zoom, as per an advert prematurely posted in a retail brochure. Among the details that are spilled is a mention of a Hasselblad camera with a 1-inch sensor in the (possibly more expensive) Pro model. How will the Magic Leap One augmented reality headset combine digital graphics with real life? We've got a better idea thanks to screens posted in a developer guide for the gadget and copied to the web – you can see how some of the menus, games and avatar editing options will work. A developer edition of the device is expected before the end of the year. Apple is being tipped to launch new iPad Pros as well as new iPhones before the year is out, and according to sources in Asia, the upcoming tablets are going to follow the design template of the iPhone X – as in minimal bezels, no fingerprint sensor, and no 3.5mm headphone jack either. Face ID is apparently going to be introduced to replace Touch ID.